Julie and I just returned from a very long week in Boston representing Pioneer Millworks the Greenbuild Expo. To any of you we met there at the show ( And there were A LOT of you! ) we thank you for coming by our booth and saying hello. It was a great show to say the least – we met HUNDREDS of people, got to see some cutting edge green technologies, and show of our new engineered flooring. Needless to say, our new product was a big hit – and why wouldn’t it be? We’ve taken the best FSC plywood around, and combined it with a thick wear layer of 100% reclaimed wood, to create a floor that will easily last as long as its solid counterpart. Glue it to concrete! Install it over radiant heat! Put it in a basement! 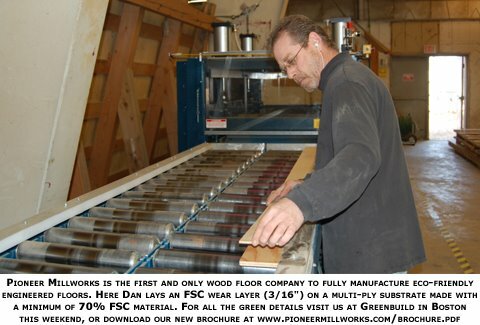 It truly is a remarkable & versatile flooring material, and we’re proud to be the first company to step up to the plate and make it the RIGHT way – OUR way, and right here in the USA. If you “got scanned” at the show ( those cell phone scanners were so cool! ) you’ll be getting a link to our digital catalog in the coming few days, in addition to some other cool information. We’re as green of a company as they come, so we’ll keep it to e-mail rather than paper & snail mail. But, in case you missed us, or if you just can’t wait to see some beauty-shots of our flooring, you can download the catalog right now! February 3 – 5, 2009, Jered will be roaming Surfaces – glad to meet you in Vegas to talk about our materials, just drop me a line! May 14 – 16, 2009, we’ll have a sweet booth set up at HD Expo where you can visit with us and see our reclaimed wood, and some stellar woodworking from New Energy Woodworks. November 10 – 12, 2009, we’re back at Greenbuild, this time in Phoenix, AZ. I don’t know about you, but 80 degrees sure beats 10 degree wind-chills in November! Thanks for checking back – time to relax on my own couch, enjoy a winter brew, and watch the snow pile up outside. Anyone wanna come shovel in the morning?